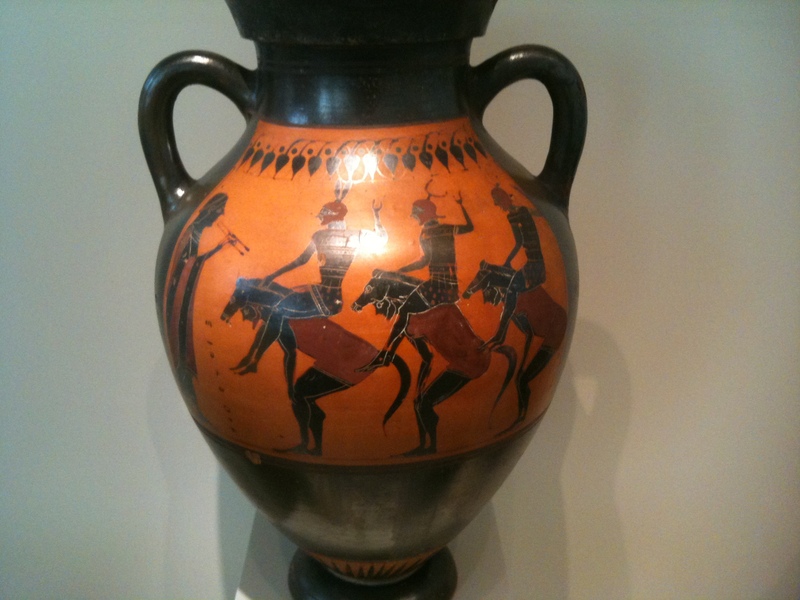 Greek “neck amphora” depicting equestrian chorus, Altes Museum, Berlin. 540/30 BC. I was googling around for details of a Greek cavalry commander called Eumenes, who’s credited with introducing the use of pillars in training horses when I found this. As Xenophon put it, would you whip a dancer? Eumenes would. During this siege, as he [Eumenes] perceived … that the horses would lose condition if they never used their limbs …. he caused their necks to be hoisted by pulleys fastened to the roofs of their stable, until their forefeet barely touched the ground. In this uneasy position they were excited by their grooms with blows and shouts until the struggle produced the effects of a hard ride, as they sprung about and stood almost erect on their hind legs until sweat poured off them, so that this exercise proved no bad training either for strength or speed. From Plutarch’s Lives, sourced here. “It was a surprise and it was a big surprise,” said teacher Bob Pomykala said. The students wouldn’t tell Pomykala what they were up to. “They said they had a great idea, but they wouldn’t tell me what it was,” he said. What they did was build a giant Trojan Horse, which, according to Greek mythology was used to sneak soldiers into the city of Troy for a triumphant battle. They built it in senior Sergio Aguilar’s yard, and then moved it right in front of Marengo Community High School. Report and photos here, at CBS Chicago. I wonder if their next project will reference the horse who carried Napoleon and who shared the school’s name? Those curious about the true identity of the little grey Arab should download Jill Hamilton’s excellent investigative work, Marengo, the Myth of Napoleon’s Horse, and also look forward to ‘War Horses of Letters’, Marie Phillips and Robert Hudson’s forthcoming Radio 4 exposé of the love letters that flew back and forth between Marengo and the Duke of Wellington’s handsome chestnut, Copenhagen.